We applaud your decision to straighten your teeth. You are about to have a smile that is not only more attractive but also healthier, because straight teeth are easier to keep clean. Now you just need to decide what kind of braces is right for you. Traditional metal orthodontics is no longer the only option. Today, you can choose Invisalign, a reliable orthodontic system that uses clear plastic aligners to move your teeth into position. 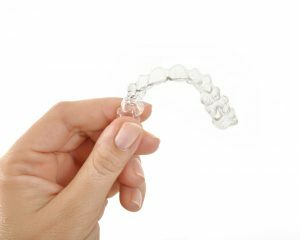 Read on to learn whether or not Invisalign is the right choice for you. Invisalign treats many of the same orthodontic concerns as braces made of metal brackets and wires, but with one major difference. Invisalign uses mouth trays made of clear BPA-free plastic to gently and gradually move your teeth into alignment. The trays, called aligners, fit snuggly over your teeth. Aside from being far less noticeable that their metal counterparts, Invisalign clear braces from your dentist in Long Island City offer a number of other advantages. For example, while metal braces must be adhesively bonded to your teeth, Invisalign aligners are removable. So whenever you want to eat or brush and floss your teeth, there is nothing in the way! Simply slip the Invisalign aligners off of your teeth and eat whatever foods you like—there are no restrictions, which is a common occurrence with regular braces. Likewise, you’ll be able to brush and floss easily without your aligners getting in the way. How Do I Get My Invisalign Aligners? After you and the dentist decide that Invisalign is the best choice for your orthodontic needs, we’ll take a collection of x-rays, impressions and photographs of your teeth. We use these to create the treatment plan that’s necessary to straighten your teeth. Based on this plan, technicians in the Invisalign lab create a 3D representation of your teeth and how they will move into alignment. With approval from the Long Island City dentist, the lab creates your Invisalign aligner trays. The trays are sent to our office so we can dispense them to you at your regular progress checks. Unlike visits to the orthodontist for people wearing traditional braces, these checks never require adjusting or tightening braces. You’ll receive aligners in a sequential series of pairs. Just wear each pair for two weeks, throw them away and move on to the next. In no time, you’ll begin to see your smile move into alignment. If you wear your aligners for 22 hours a day, then treatment should be completed in six to 18 months. Invisalign may be the right choice for your smile and your lifestyle. Contact LIC Dental Associates today to schedule a consultation.